Nineteen years ago simple security guard David Dunn (Bruce Willis) was the only survivor of a train wreck that killed everyone else on board. He grew to believe he has superpowers that make him unbreakable. For every superhero there’s a supervillain. They call him Mr. Glass (Samuel L. Jackson). Born with the rare genetic disorder Osteogenesis Imperfecta, Elijah Price (Samuel L. Jackson) is the opposite of unbreakable having had ninety-four broken bones in his lifetime. His brain however is far superior than any other. Their final showdown nearly twenty years ago left Mr. Glass locked away and the unbreakable man who would become known as the Overseer hiding his identity from the police as he uses his newfound powers to stop criminal thugs. Now a new threat, a Beast (James McAvoy) who’s been consuming unclean teenage girls must be stopped but when the world doesn’t know you exist how can you fight to save it? D.C. officials set to visit the opening of Philadelphia’s tallest skyscraper, the Osaka building. It’s said to be a modern MARVEL. 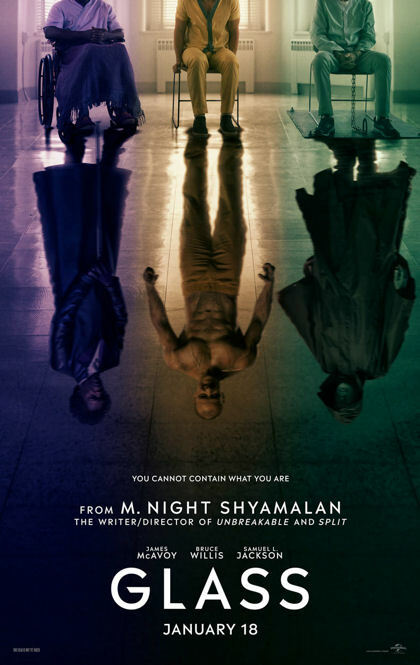 At the end of the impressive movie Split, Unbreakable star Bruce Willis returns for a cameo appearance as David Dunn exciting audiences and connecting the two films in a newly created M. Night Shyamalan superhero universe. With the announcement of Glass, both superhero and M. Night Shyamalan fans marveled at what could come next. As Marvel Films increasingly lose touch with reality making their movies and characters less and less human, and post Christopher Nolan DC movies aren’t even able to find realistic humanity in their characters to begin with, I would have been happy with a simple subtle superhero, supervillain showdown where Beast meets Unbreakable in a clash between two characters who barely have extraordinary abilities but are still grounded in the day to day lives of the rest of humanity. In true comic book and Hollywood form, Glass raises things to the unneeded next level. In true M. Night Shyamalan form, he tries to add a twist that in this case just wasn’t ever needed. While Unbreakable and Split were subtle movies, staying in the shadows only to reveal their secret identities in their classic M. Night Shyamalan twist endings, the third installment of this superhero trilogy doesn’t have that luxury having to live as the superhero movie its already been exposed to be and raise the question if that is the actual reality of these characters. The attempt to create a possible delusion of the characters minds about their abilities is weak and one of my least favorite aspects of the movie. A truly outstanding film could have been created raising the question of psychosis or reality ala Phantasm: Ravager, only on a larger scale and at M. Night Shyamalan’s direction. Glass never explores that possibility in depth, using Raven Hill Memorial Psychiatric Hospital primarily as a set to bring the characters together. After few box office flops and possibly even worse, movies that were on almost no one’s radar, production of Glass seemed rushed to me starting immediately after the success of M. Night Shyamalan’s comeback hit Split. In turn there are many flaws in this Glass picture. For a high security facility Raven Hill Psychiatric Hospital sure seems easily moved about. Then when I get to thinking about comic books all the bad guys Batman locked away sure seemed to get out of their prison or psych ward easily enough whenever they were needed for the next issue. As illogical as a comic book, which is why I never personally got into comics, it does beg the question, if Mr. Glass can so easily manipulate his way around this hospital, why hasn’t he already escaped in the presumable eighteen years he’s been locked away? Again, its much like a comic book character that isn’t needed for years until someone resurrects him with a weak backstory of what he or she has been doing the last decade. The use of Joseph Dunn as the earpiece to his dad’s Overseer superhero character is something that fit perfectly into place and I would have much rather seen Unbreakable 2 than this cataclysmic film. The return of child actor Spencer Treat Clark is something I enjoyed very much as childhood characters often get recast to my dismay. Kidnap victim Casey’s return didn’t make sense in the movie other than to have a human connection to “The Beast” and get the growing name value of Anya Taylor-Joy back in the film. Mr. Glass’s human connection is his mother Mrs. Price (Charlayne Woodard) who sets off our pattern recognition with prosthesis that should have been better with a multi-million dollar budget. To the detriment of the brilliance of Split, Glass locks away its characters and with the use of flashing lights has James McAvoy cycling through Kevin’s multiple personalities to the extent his excellent performance in Split is turned almost comical in Glass. Even worse, an endless use of a superhero universe that could secretly deliver a surprise Split addition was killed. Either M. Night felt the need to move on from the universe he just created or he thought the Glass finale would open it up indefinitely when in fact he killed at least my own interest in the saddest most pathetic way. I still liked Glass. It was what I wanted up until the hospital and still captivating until the ending. Samuel Samuel L. Jackson and Bruce Willis are as good as they were in Unbreakable. James McAvoy’s characters don’t work being that overexposed. I kept expecting to see a grown boy who sees dead people added to the universe but that didn't happen and I'm probably thankful for it. Overall the subtle superhero aspects that played out in a suspense thriller with horror aspects in Unbreakable and Split are lost as Glass becomes too day time soap, unrealistic comic book for my taste.